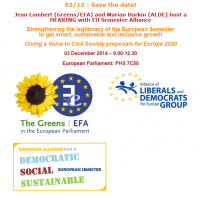 Next 03 December, Jean Lambert (Greens/EFA) and Marian Harkin (ALDE) host a HEARING with EU Semester Alliance on Strengthening the legitimacy of the European Semester to get smart, sustainable and inclusive growth – Giving a Voice to Civil Society proposals for Europe 2020. 03 December 2014 – 9.00-12.30 – European Parliament: PHS 7C50. This timely event will debate proposals for increasing the legitimacy of the European Semester and its effectiveness in delivering on Europe 2020 goals, particularly social and environmental targets, through strengthening civil society dialogue. See the final programme here! Invited: Commissioner Dombrovskis and Commissioner Thyssen, cross-party MEPs round table, cross-sectoral EU Alliance of civil society and trade unions engaging at national and EU levels. ← Better Europe Alliance (Ireland) Special topic: linked-up planning for Europe?